Earn your share of a $60,000 prize pool in this week’s Survivor League at DraftStreet! The entry fee is just $22, with a maximum of 3,000 entrants. The top 375 finishers get paid, with first place taking home a cool $15,000. The Survivor League is a four-day tournament beginning Tuesday, July 8th. The deadline for entry is Tuesday at 6:05pm central time. The top 1,500 advance after Day 1, the top 750 after Day 2, and the top 375 advance after Day 3. Those final 375 play for the $60K in prizes. Don’t hesitate! 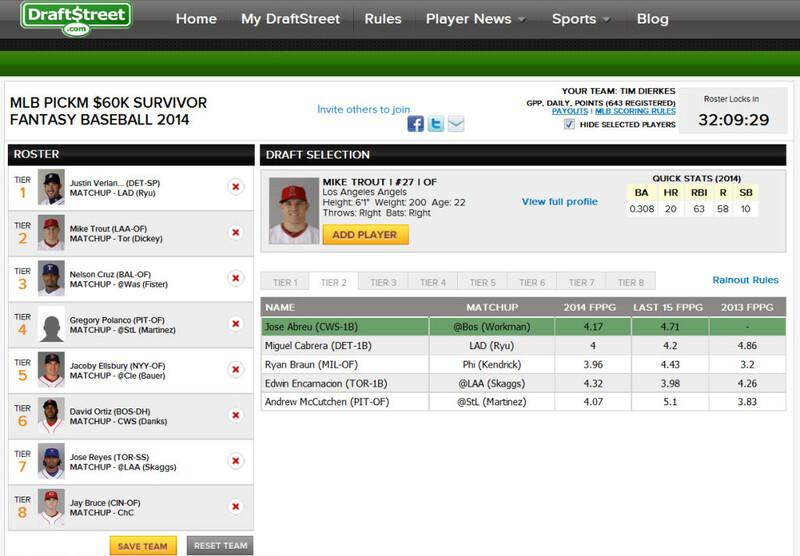 Sign up for this week’s Survivor League at DraftStreet and you may be the one taking home $15,000!